The northeast area of the U.S. (Connecticut and Massachusetts) got hit with an early winter storm on October 29th. There were still lots of leaves on the trees and the heavy, wet snow accumulated on them. The weight snapped branches. As I sat in my quiet house, I could hear branches breaking in the nearby area. Crack, boom! was a sound going on everywhere. The result was the loss of power almost everywhere. Banks are closed. Schools are closed. Grocery stores and gas stations were closed. People did not have access to basic necessities. The power outage was a severe one and widespread as I went to both states to try to find access to an ATM with power and food. Everything was down. I learned. 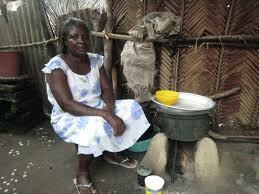 In some parts of Africa, it is the woman’s responsibility to provide food for the family. It is the woman who tends to the gardens and has vegetables and spices to feed the family. She also fetches the water. If men go hunting and return with nothing, the woman is prepared. My father’s words ring true. Always be prepared for an emergency. Now I will take stock of medical supplies in my home – band-aids, bandages, medicines, etc. I have my checklist of storable food and will absolutely start keeping cash in the safe. Blankets? No problem. This is New England. I’ve got those. Ladies, be prepared. When all else fails, the family looks to us.